Another step in the slow-moving development of the former Pizza Hut location across from the CTA Blue Line stop at Division Street fell into place June 27 when the City Council changed its zoning to the RM6.5 high-rise residential class. Earlier in the week, East Village Association planning co-chair Scott Rappe spoke in favor of the zoning change at 1601-15 W. Division and 1148-56 N. Ashland. A companion measure lifted the "pedestrian street" designation for the property. 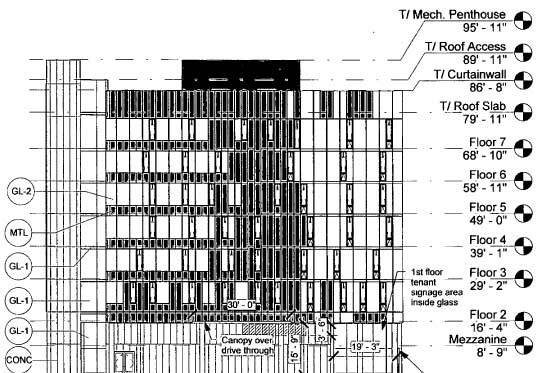 That would allow a group led by Newgard Development to build a bank drive-through, shown here in the original October 2011 zoning request. The developer now plans an 11-story apartment building, with the PNC Bank storefront on Ashland Avenue and drive-through along the south alley. A number of additional measures must pass the City Council, including Ald. Proco Joe Moreno's proposal to allow minimal parking as part of a "transit-oriented development."